When you think about fitness, your first thought is usually about feeling healthy and looking young. However, a Polish bodybuilder has a slightly different philosophy in his approach to personal fitness. Pavel Ladziak, a 35-year-old bodybuilder from Warsaw, Poland, actively believes in dying your hair to look older. When you first see a photo of Pavel, your immediate thought is that you’re looking at a very fit 60-year-old man. However, when you learn that Pavel is only 35 you’re left wondering why he chooses to look like this. He spends large amounts of money to maintain his beard and hair dye treatment to age himself by a few years. In an era when growing old seems to be more of a tragedy than something to be celebrated when it comes to your looks, Pavel is challenging this idea by looking older and healthy at the same time. When he noticed his hair started to turn silver, instead of purchasing personal dyes to make it appear darker, Pavel went in the opposite direction and strived to look far older than he actually is. Pavel spends his money on products to dye his beard and hair. 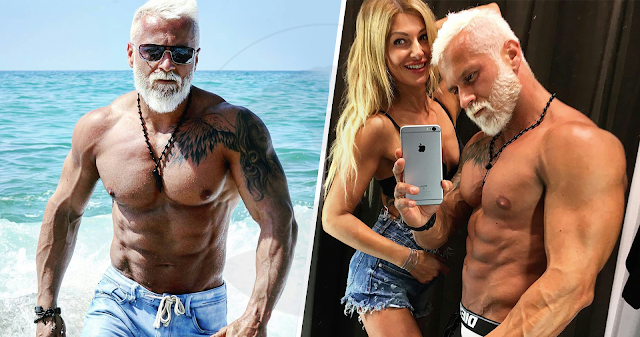 You might wonder why, but after seeing his amazing physique shared through his Instagram account (@pavel_ladziak) aka the Polish Viking, it’s clear that in this case, older is sexier. Pavel now works as a fitness model, brand ambassador, and jewelry sponsor. He showcases his unique look through posting post-gym workout selfies on his Instagram. When you look at Pavel’s transformation from what he looked like back in 2007 to now, it’s hard to believe that the two are still the same person. We suppose in many ways, Pavel really isn’t the same person, after transforming his entire body and really changing his entire lifestyle. Pavel the “Polish Viking” has well over 400,000 followers on his Instagram account, making him an inspiration and a real advocate for being a social media influencer. Here we can see Pavel taking a unique mirror selfie with his wife Magda, who has her own Instagram account (@magda_m_108). Together the two make a very attractive and adorable couple. Here we can see Pavel posing outside the newest metropolitan area cityscape of Warsaw, Poland. Traditionally, Warsaw, Poland, looks like a city lost in time, however, a lot of modern buildings have been erected in the area over the past few years making it a unique travel destination. Pavel models off some more modern jewelry for the company he represents named Scoreccione that has a wide variety of lifestyle products to offer consumers. This final side by side photo of Pavel and his wife Magda shows just how amazing a few years can transform two people. In an era where health and fitness are taking center stage for people everywhere, Pavel serves as an inspiration for anyone looking to transform their lives for the better. It’s clear that with a lot of hard work, eating right, staying healthy and a lot of hair dye, you can have a look very similar to Pavel’s the more you persevere.